Last week we asked our readers for their best tips for meal planning. How do you get dinner on the table, week in and week out, without getting bored? How do you stay energized and engaged with the act of cooking at home? Here are fifteen of our best and most universal tips for learning how to plan your meals. 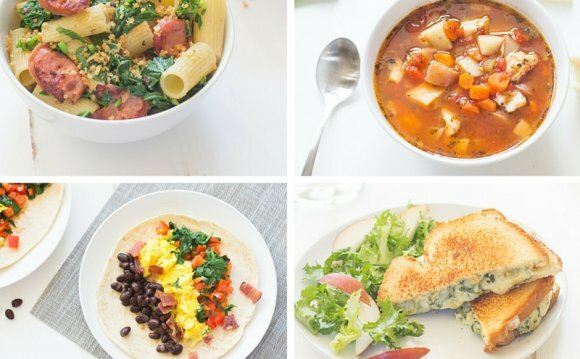 What is meal planning? It's whatever way you organize yourself to cook a meal, whether that's breakfast, lunch, or dinner. It is the plan you make before you shop. Some people plan a month in advance, freezing neatly-labeled packets of soup and stew. Others wing it, shopping for that evening's meal at the farmers' market and picking up whatever looks good to them. Meal planning is a really personal thing. What works for you may not work for me. The goal, I think, is to find a process that is both enjoyable and effective. One of the things I sensed in our readers' comments is that many of them enjoyed reading through cookbooks, clipping recipes from blogs and websites, and taking some time to anticipate cooking. I think this is an important part of meal planning. Meals aren't just solutions to the problem of needing to eat; making a meal is also an expression of creativity — even if it's just cutting a PB&J sandwich into a new shape. Find ways to inspire yourself and to look forward to cooking. That's the spirit that animates this whole endeavor. Secondly, I saw that readers were doing whatever worked for them. There's no right way to plan your meals; you should just do what is effective for you. I read over ten ways of gathering and organizing recipes. Your way may be messier and less elegant than you like, but if it works, why worry? Don't spend too much time looking for the most perfect and impeccably-maintained system. The system is just the tool. The point is the meal. Well, really, it's people, and enjoying good food with them and nourishing oneself. Spend time each week looking for recipes. Ask your partner, family, and roommates what they like to eat. Choose a shopping day and make a shopping list.